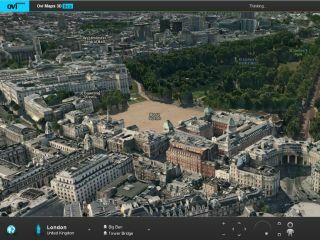 Nokia has revealed its latest maps-based toy – photorealistic 3D models of major cities for Ovi Maps. The new three-dimensional topography is only available on the web version of Ovi Maps, however, so don't go running to your Nokia N8 to check it out. While 3D mapping isn't exactly new – Google Maps and Bing Maps have both offered three dimensions for some time - Nokia reckons that its Ovi service is "the most realistic available". The new 3D maps feature entire cities, including suburbs, all set for virtual exploration, and users can scale the maps up and down, as well as 'move' around buildings for a "super realistic perspective of new places", says Nokia. They're not wrong; it's an impressive, great-looking map experience, although we'd like a little more control. It was awfully difficult to find the 3D images of TechRadar HQ without a postcode finder. Don't take our word for it though, you can access the 3D visualisations for free by visiting maps.ovi.com/3D yourself. The live beta service features 20 cities, with road-level imagery for five cities already available: London, San Francisco, Oslo, Copenhagen and Helsinki. It's all part of Nokia's plans for bigger and better location-based services, something Bing is also looking at with great interest. "Ovi Maps' photorealistic 3D models of metropolitan areas are a significant step towards our vision of bridging the real and virtual world, with location-based services being the glue," said Michael Halbherr, senior vice president, Nokia.